Investor Pulse from Spectrem Group is a monthly reading of investor attitudes. The report is fielded each month to a group of approximately 1,200 investors. 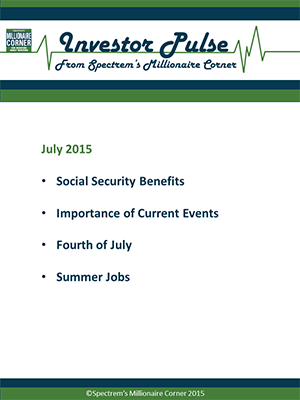 This month’s topics include: Changing the age of Social Security benefits, 4th of July, summer jobs for children/grandchildren and more. Millionaires on the Fourth of July—Picnics or Parade? Fixing Social Security—A Retirement Income Benchmark to Receive Gifts?